We are humbled to offer this doubly-terminated crystal from Arkansas to you. 1/2x 2", one termination is twinned with record keepers and bright rainbows. The other is a rare, 6-edged shield face with more record keepers and a tiny diamond [the only kind of] window. There is also one extra prism face. There are penetrator crystals to a tabular 1/16x 3/8". 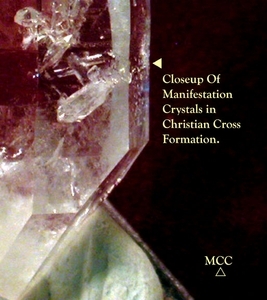 AND there are multiple, rare manifestation crystals, TWO SETS OF WHICH FORM CHRISTIAN CROSSES. They can be seen without, but much more satisfyingly with your loupe. The larger cross is approximately 1/8x 1/4".